Squadron Signal Publications is a on-web hobby store that also sells books. The color art in this book is by Don Greer and other illustrations are by Todd Sturgell. Copyright date is 2012. This book is soft cover of 80 pages in 8 1/2" x 11 1/4" page format. The front cover shows German soldiers sitting atop a Hetzer and preparing an ambush in France, awaiting Allied armored columns penetrating into France during Autumn 1944. The low profile was one of the advantages of the Jagdpanzer 38. The Hetzer proved to be a most unwelcomed surprise for Allied tanks operating on the Western Front. The back cover show a Jagdpanzer 38 belonging to the 97th Jager Division (97th Infantry Division) durting retreats in Bohemia in Czechoslovakia in April 1945. This Hetzer carries a factory applied camouflage. These 2 covers are by Don Greer. 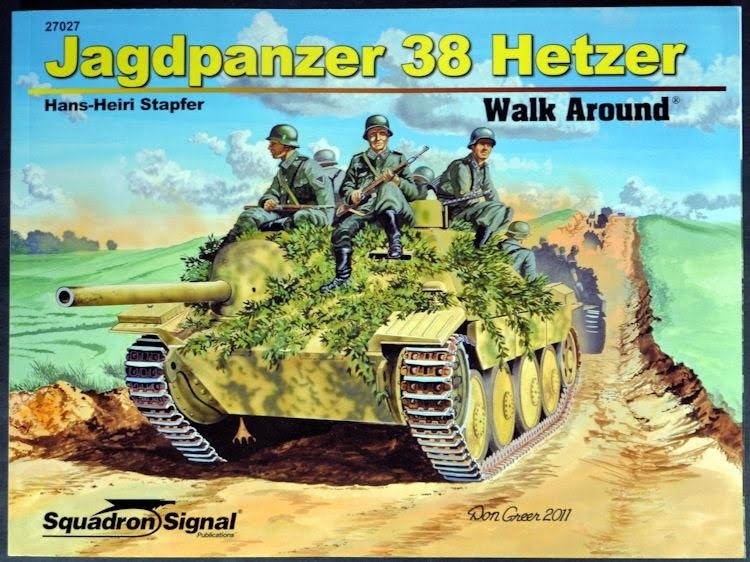 There are 40 black and white war time photos in the book, 5 black and white line drawings of various marks of the Hetzer, 164 color walk-around type photos of restored Hetzers at Aberdeen, the Budswehr museum and the Swiss Army museum. There are 2 black and white 5-view line drawing of a Hetzer with specifications, 5 black and white photos of the hull interior, black and white line drawings of the muffler and flame dampners, the notek and convoy lights and main gun variants. In the back of the book there are 12 color profiles. I purchased my book at the local hobby shop which went out of business on June 25th, for 40% off.